The restored farm, Le Bernadou lies at the end of the small country road in the middle of it’s surrounding grounds. 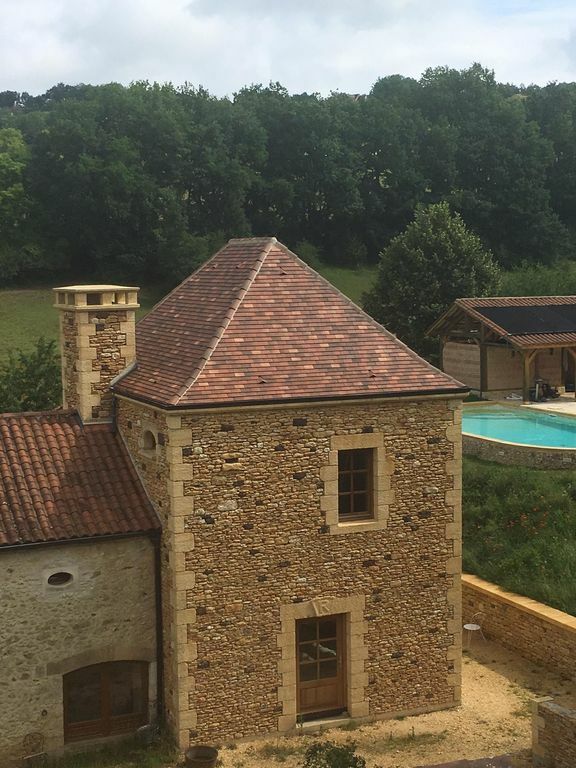 The group of buildings consist of: the main house , the original barn which has been converted into an apartment, and at the end of the barn we have built a tower out of natural stone. The swimming pool measures 12 x 6 m and has a shallow part of 1.2 m and a slope to the deep end of 1.8 m and internal roman steps. there are two traditional oak framed buildings, the poolhouse with a fabulous bar fitted with a fridge, icecube machine, cups and glasses washer, sink and worktop, and an open air showerroom with solar heated warm water system and a cold bucket shower. It's just wonderfull to relax in during the long summer evenings while gazing up to the stars. Albert and Roos, living and working in the Dordogne since the late eighties, welcome you in this beautiful part of France. Already at a young age, and as we still feel today, we decided to take the plunge and build our lives here with our family, and we never regretted that for a second. We rent out our house (and others) and know the most beautiful places with peace and space. Family friendly house with perfect pool overlooking amazing views in a fantastic location. We had an amazing stay at this lovely house in Marnac, Dordogne. There are lots of places to visit nearby including troglodyte caves, canoeing on the Dordogne and the pretty local town of St Ciprien. A particular highlight of the accommodation itself is the pool, with pool bar (with the addition of an ice machine) , outdoor shower and Roman Bath. My family and two other families had 10 -14 days in this lovely location. The facilities were well suited for the size of the party. A well equiped kitchen, great outside space, fantastic pool with bar area and showers. The whole property led to a very relaxed holiday. As my title states great for large groups and even more so once the development of the property is complete. Would definitely return to this 'shabby sheek' property. Thanks Victoria and your group for staying with us. It’s always a great pleasure to welcome our guests at ‘ Le Bernadou ‘ and the lovely Dordogne area to relax with friends and family ; just having a great time !! We are really pleased you all enjoyed your stay with us and it would be great to welcome you all back again ;thank you so much for leaving it all nice and tidey. In the coming year(wintertime) we will be carrying on with with the new buildings of ‘Le Bernadou’ and will be presenting new features on the property for the next season. We had a large family gathering of 14 plus a dog at Le Bernadou. Ages ranged from 5-78. It suited our group very well especially due to the location, variety of sleeping quarters and the huge amount of indoor and outdoor space. There was plenty of room for a quiet moment and for families not to get on top of each other. The standout feature is the pool area and Roman bath which was hugely popular. It has been done beautifully and suited all ages. Sitting on the hot tub watching shooting stars was wonderful at night! We didn't have particularly great weather but if it was very hot I doubt you would move from the poolside. The huge outdoor table was great as it meant we could all eat together comfortably. There is plenty to do in the area if the weather isn't great. We visited nearby sarlat and Domme, canoed down the wonderful Dordogne ( easy for all ages) and visited local castles. There is a ferme d'auberge in the village that does a set menu which is well worth visiting. There were a few points regarding the accommodation that we felt could be improved which I have mentioned to the owner which can be easily rectified. This is the second time we as a family have hoildayed here. We fell in love with the property and its surroundings the first time in 2012 and it just confirmed why when we went back this year. The house and grounds has everything you need to have a complete, comfortable and realaxing stay. Set in his own substantial grounds away from it all at the end of a long country lane, although still within range of other homes, it is extremely private and peaceful and totally safe for all the children to be able to enjoy the outside life without worrying about where they are. They loved the freedom and space, the swings and trampoline, table tennis and of colurse the beautiful pool. Not just a pool though, but almost an extension of the house, with showers of its own, a bar, comfortable seating, undercover (not that this was needed apart from when it was too hot) and a very welcome Romnan Bath, especailly in the evening. The views from where the pool is situated are just wonderful!! We are a pretty large group and there was plenty of room for everyone and plenty of space if you wanted a bit of peace and quiet away from the others. Breakfast in the morning on the veranda was one of the highlights of my day; total peace and quiet (well at least until the children woke up) watching the sun come up at the end of the garden and fields and straight onto the veranda where you sit, what a start to the day!! The beauty of Le Bernadou is that althougn you are away from it all, a very short drive takes you back into the two nearest towns and their shops, restaurants and supermarkets, with the river only just round the corner as well. It doesnt take that long to get to the other main areas such as Sarlat and Domme either, so we had the best of both worlds. Thank you Albert and Rose for a great stay. Peter and the rest of the Burton-Rees family..
We were delighted to read about your enthusiasm and in particular that everybody was able to enjoy the house ,the pool and Roman Bath, the surrounding fields and woods ; and of course the beautiful Dordogne area! It was a pleasure to have you and your charming family,your children and grand-children to stay at "Le Bernadou", and it was lovely to welcome you all back the following summer!! We will keep on doing our very best to make each stay at "Le bernadou "a great holiday and of course we are continuously improving the buildings and the facilities. Nous avons passé de très agréables vacances en famille et entre amis. Le coin piscine a particulièrement été apprécié des petits et des grands. La maison est idéalement située dans le Périgord pour être à la fois au calme et près des principaux centres d'intérêt et des commerces. Albert et Rose ont toujours répondu à nos demandes de façon rapide, précise et sympathique. A recommander vivement. Merci Xavier d’être venu ici en Dordogne, c’était un vraie plaisir de vous rencontrer et de vous accueillir. Chaque année nous essayons de améliorer la maison et les alentours. Gîte très confortable et bien équipé avec un grand salon intérieur, un salon télé (et piano), une salle à manger + salon extérieur, piscine de bonne dimension, jacuzzi, barbecue, plancha, table de ping-pong, etc. Tout ce qu'il faut pour passer un excellent séjour. Les propriétaires sont très sympathiques et arrangeants. Nous étions 18, soit un peu plus que le nombre de couchages indiqués sur l'annonce. Ils ont accepté que nous plantions une tente sur le terrain (8 hectares dont une partie boisée) pour loger l'excédent de vacanciers.